The flexible arms are powered electrically and so can do without the usual pneumatic equipment or other bulky accessories. As the shape-memory alloy itself has sensor properties, the arms can be controlled without the need for additional sensors. The new technology can be used to build large robotic arms with the flexibility of an elephant's trunk or ultrafine tentacles for use in endoscopic operations. From the April 1 to 5, the research team will be at Hannover Messe, where they will be using prototypes to demonstrate the capabilities of the shape memory arms at the Saarland Research and Innovation Stand. Seelecke's team is looking for partners interested in developing the technology for practical applications. There are functional limits to the flexibility of both human and robotic arms. The joints are often bulky and connect rigid bones or mechanical assemblies. Motion is typically restricted to certain spatial directions. In contrast, an elephant trunks and octopus tentacles offer far greater agility. The presence of tens of thousands of muscles enables these creatures to move the trunk or tentacle in all directions, to bend it to just the right degree and to grip things with great power. 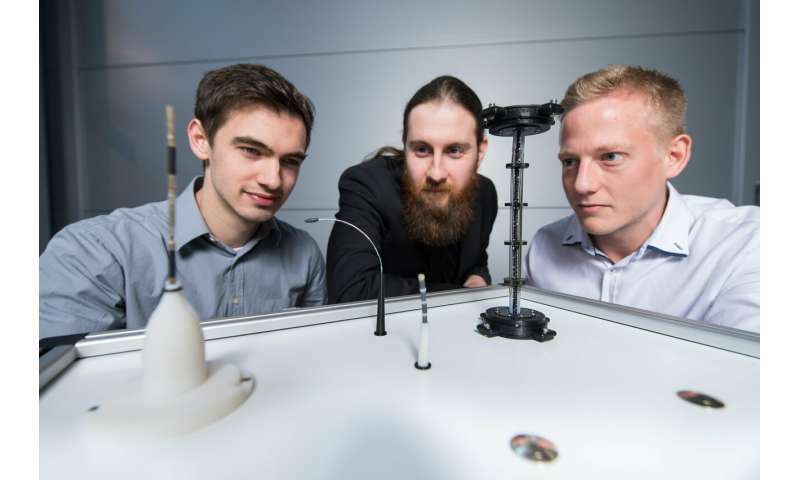 The engineers at Saarland University have drawn inspiration from these natural models and are developing robotic arms that eliminate the need for joints or rigid skeletons or frameworks, creating structures that are both lightweight and extremely supple. Professor Stefan Seelecke and his team are collaborating with researchers from Darmstadt Technical University to develop thin, precisely controlled artificial tentacles. In future, the system could find use as a guide wire in cardiac surgery or as an endoscope in gastroscopic and colonoscopic procedures. The researchers are therefore equipping the artificial tentacles with additional functions such as a gripper or a tip with adjustable stiffness that delivers an improved pushing force. But the technology can also be scaled up to produce large robotic arms not dissimilar to an elephant's trunk. The flexibility of these new robotic arms comes from the artificial muscles used by the Saarbrücken research team. These muscles are composed of ultrafine nickel-titanium (nitinol) wires that contract and lengthen in a controlled manner. The ultrafine nitinol wires contract like real muscles, depending on whether an electric current is flowing or not. "Nickel-titanium is what is known as a shape memory alloy, which means that it is able to return to its original shape after being deformed. If an electric current flows through a nitinol wire, the material heats up, causing it to adopt a different crystal structure with the result that the wire becomes shorter. If the current is switched off, the wire cools down and lengthens again," explains Professor Seelecke. His team at the Intelligent Material Systems Lab at Saarland University has created bundles of these wires that act as artificial muscle fibres. "Multiple ultrathin wires provide a large surface area through which they can transfer heat, which means they contract more rapidly. The wires have the highest energy density of all known drive mechanisms. And they can exert a very high tensile force over a short distance," explains Seelecke, who also conducts research at ZeMA—the Center for Mechatronics and Automation Technology in Saarbrücken. The research team at ZeMA is developing a range of applications for these wires, from novel cooling systems to new types of valves and pumps. For the robot arms, the researchers link the wire bundles so that they act as flexor or extensor muscles, which, working in concert, produce a flowing motion. "The tentacles that could be used in the future as medical catheters or in endoscopic procedures have diameters of only around 300 to 400 micrometres. No other drive system is of comparable size. Previous systems used for catheter procedures were significantly larger and this tended to limit their capabilities," explains Paul Motzki, who wrote his doctoral thesis on the shape memory wires and is a research assistant in Professor Seelecke's group. The new tentacles can be very precisely controlled and can be used to create multifunctional tools. For example, the distal tip of the tentacle can be made to perform a pushing movement. The exact pattern of movement required is modeled by the researchers and then programmed on a semiconductor chip. And the system has no need for other sensors. The wires themselves provide all the necessary data. "The material from which the wires are made has sensory properties. The controller unit is able to interpret the electrical resistance data so that it knows the exact position and orientation of the wires at any one time," says Paul Motzki. Unlike conventional robotic arms that require power from an electric motor or from a pneumatic or hydraulic system, the arms have no need for any such heavy equipment, only electric current. "This makes the system light, highly adaptable and quiet to operate, and it means that production costs are relatively low," says Professor Seelecke. The research team will be exhibiting their system prototypes at Hannover Messe and will be demonstrating the potential of these novel continuum robotic arms.